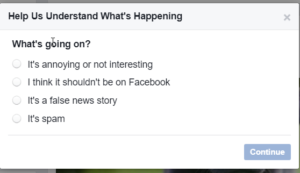 Sometimes it seems like I no sooner provide instructions on how to do something on Facebook, than Facebook changes it. I get questions about deleting a post a lot, so time to write a new set of instructions. Thanks, Facebook. 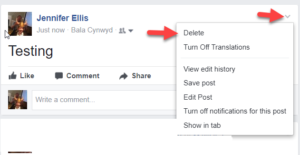 So here is how to delete a Facebook post from your wall as of August 30, 2017. You cannot physically remove a post that someone else posted on a friend’s wall. You can, however, hide it from your view, and if you like, report it for inappropriate content. Begin by looking for the carrot symbol on the upper right hand corner of the post. When you click on it, you will see a drop down. At the very bottom, you will see “Report post.” Click on that. When you do, another box will pop-up. You simply need to choose the appropriate option. Depending on what you choose, it will simply hide the post, or it will provide you with the opportunity to report it. 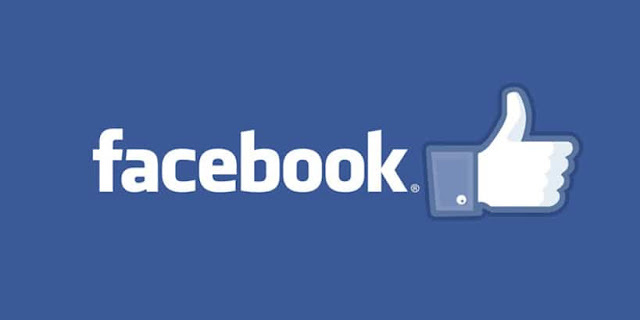 Let’s say you posted something on a friend’s wall, and now you want to remove it. You again begin by clicking on the carrot. Then you will see a list of options. Delete is second from the bottom. Again, simply click on the carrot on the upper right and then choose delete. This time delete is higher up. Instead of hovering your mouse on the carrot, you need to hover it next to the comment you want to delete. This time, instead of a carrot, you will see three dots. The dots only appear when you hover your mouse over them. 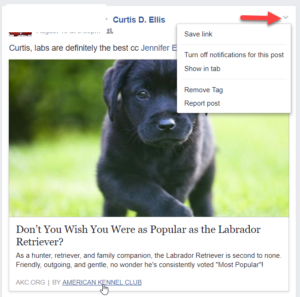 Once you hover your mouse, the dots will appear and you will see the option to edit or delete. On your own wall, if you delete a post, all of the comments will go as well. But if you just want to delete a comment that someone else wrote, the process is similar to deleting your own comment. However, this time when you hover your mouse next to the comment, you will simply see an X. When you click on the X you will be provided with the option to delete the comment. There you go. 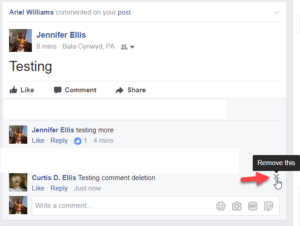 This is how to remove posts and comments from Facebook on a desktop computer. I checked on an iPad. The same carrot appears for posts and the steps are much the same. For comments, you simply need to click on the comment. The available options will appear. You will not see the three dots or the X.